A pit bull can be a loving, loyal asset to your family, but the breed isn't for everyone. Prospective owners should carefully consider whether they're ready to commit to training and socializing their dog before taking on a pit bull. Spend plenty of time with your pit bull and you'll be rewarded with a smart, friendly dog, but you should be aware of some of the issues surrounding ownership. Pit bulls are known to be loving, patient companions for children. Early socialization with many different people helps your pit bull develop his goofy, playful manner and loyalty to his people. Your pit bull might have a strong, fierce appearance, but he fails as a guard dog -- he figures everyone loves him, so the guy coming through the door to steal your stereo is no exception. With careful attention to socialization, your pit bull should typically get along with other dogs, but every dog is an individual. While he might not instigate a fight, if another dog issues a challenge, he's not likely to back down. Once he's fighting, he won't stop until he or the other dog is seriously injured. If you don't take the time to properly socialize your pit bull, you might find that he develops continued aggression toward other dogs. Pit bulls naturally have high prey drive. Even a dog raised with other pets can attack if your bird, cat or rabbit makes a sudden movement. Don't leave your pit bull alone with other animals. If you're looking for a pit bull to add to your family, you'll find plenty to choose from at local shelters. 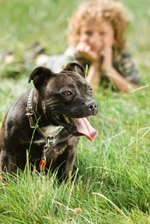 Because the breed is often promoted as violent and tough by those engaged in criminal activities, including dog fighting, the pit bull suffers from misguided breed discrimination. Many shelters employ a standardized evaluation process to determine if dogs have socialization issues or violent tendencies. The pit bulls available for adoption have been health-screened, immunized and spayed or neutered. A dog that's at least 2 years old will have a well-developed personality, and you can easily see what kind of temperament he has. Your new family member won't have a problem bonding to his new family, and you'll fall in love, too. You know that your well-socialized dog loves people and isn't a danger to the general public, but your neighbors may feel otherwise. Pit bulls are stocky and strong. They might be as sweet as lambs, but they have a bark as vicious as a lion's roar. The myths and stereotypes surrounding the breed lead to local legislation. You may have difficulty renting an apartment or obtaining homeowner's insurance if you own a pit bull. Before you adopt one, check local laws to make sure that the breed isn't prohibited in your town. You can do your part to promote the pit bull as the friendly, enthusiastic canine companion he is -- socialize him, train him with proper puppy manners and introduce him to the neighbors. Your pit bull is eager to learn new things and well-equipped for the task with his high intelligence. Start his training program early, and you'll find that he's happiest when he's working, competing and making his humans proud. Your pit bull is an enthusiastic student and loves to spend time with his people -- take advantage of his personality and train him well so he'll be a good canine citizen. Fail to spend enough time training your pit bull and you could have a real problem on your hands. Pit bulls can weigh as much as 85 pounds when full-grown and are a compact, powerful package of pure muscle. He can be difficult to rein in once he's an adult -- the time to train this dog is while he's a more manageable puppy. A pit bull that is allowed to run wild without rules can become a stubborn bully that uses his bulk to push his way around.